The success of our ministry is dependent upon the generosity of individuals, businesses and churches who are willing to come along side of us in sharing the gospel of Jesus Christ and protecting the lives of the unborn. If you wish to participate financially to support this ministry, please take a moment to click on the Paypal link below. Did you know that shopping on Amazon.com can benefit Sav-A-Life Bessemer? Simply click on the link below to begin your shopping experience and we will receive a portion of the proceeds from the money you spend on your Amazon order. This is our unique link so there is no need to search for our name in the charity search section. Be sure to sign in at smile.amazon.com. Did you know purchasing your vehicle tag can help support our ministry? Next time you renew your car tag, ask for the “Choose Life” Tag! Tags purchased in Jefferson County support Sav-A-Life Bessemer and you are also a billboard for LIFE! 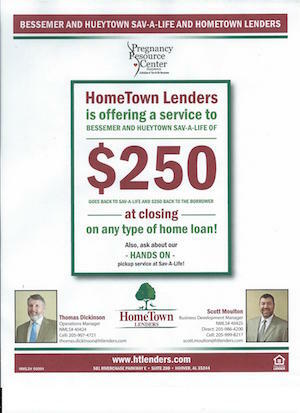 Hometown Lenders is offering a special discount and donation package for friends of Sav-A-Life Bessemer! One of the most valuable contributions is your time. Client Advocate – Minister to girls and provide options and counseling. Contact Becky McDonough, Executive Director, for an application at SALdirector@aol.com. Parenting Coach – one on one mentor for moms participating in the Earn While You Learn program. Contact Angel Hudgins, Education Director, at Angel_Hudgins@hotmail.com. Church Liaison – keep your church aware of Sav-A-Life Bessemer’s needs and events by working with your pastor and church staff to ensure they are aware of upcoming events. You are our voice in your church. Contact Jackie Wise, Office Manager, at savalifebessemer@gmail.com. Would you like a representative from Sav-A-Life Bessemer to come share with your church, small group, civic organization, student ministry or, to participate in your missions fair. Contact Becky McDonough (SALdirector@aol.com) or Angel Hudgins (Angel_Hudgins@hotmail.com). Watch our newsletter and facebook page for baby items that are needed for our crisis closet. We do accept new layette items and baby clothes up 24 mo / 2T (like new clothes are also accepted). We will also post if we need help with our baby showers. Maternity clothes are always in need. Baby booties are always given when a client has a positive pregnancy test, therefore, they are are always needed!!!! Even after hearing all the facts and sharing key resources with a client at our center, an important decision which could impact the life of a baby, may still remain undecided. Sometimes girls come into to our office in serious trouble. Bad relationships, no family, struggles with addictions. Literally, it is sometimes a matter of life and death! We need prayer warriors that would be willing to pray for the girls who face difficult decisions. If you would be willing to be a prayer warrior for this ministry, please email us at savalifebessemer@gmail.com. When we have someone that is in urgent need, Jackie Wise, our office manager, will email you the prayer request. We will also send you any updates concerning the emergency if and when we know. To protect our client confidentiality, all names are changed for these communications. Pray specifically for all our ministries and volunteers. Pray for funds that are needed for all the programs. Pray also that women and men will choose life for their unborn child and their hearts be forever changed by Jesus.